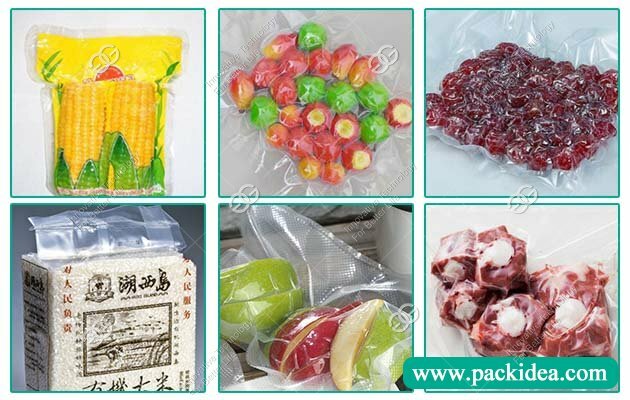 Application: Suitable for packing meat, grain, hardware, also can pack liquid, pickles, etc. The GGDZ-1000 continuous vacuum packing machine for food is one of the best-selling vacuum packaging machine of Henan GELGOOG Company. The maximum sealing length of the vacuum packaging machine can reach 1000mm, which can meet the high yield requirement. The machine has the characteristics of locate accurately, stable lifting and rolling belt. The equipment operator does not need to manually adjust the conveyor belt position, save time and effort. 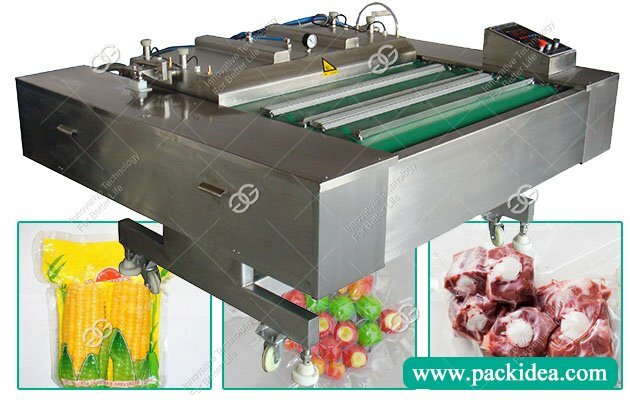 Transmission chain continuous vacuum packing machine has high configuration of accessories. The contactor adopts the Japanese omron, the switch appliances adopts the French schneider brand, the quality is reliable, the performance is stable. The whole machine can be inclined to four angles, which can meet all kinds of packing requirements. Rolling continuous packing, improve work efficiency. The machine has full stainless steel SUS304 material; 5mm vacuum chamber super-thick steel plate, 8mm vacuum chamber floor, never deformation; Imported PLC programmable logic controller; Advanced external rotary vane vacuum pump technology, low noise design; Equipped with the V100 vacuum pump. (gas speed 100m3/h). This continuous rolling vacuum packaging machine is exquisite, well-made, the operating system is fully airtight, and the whole machine can be used in packaging of pickles production or liquid. 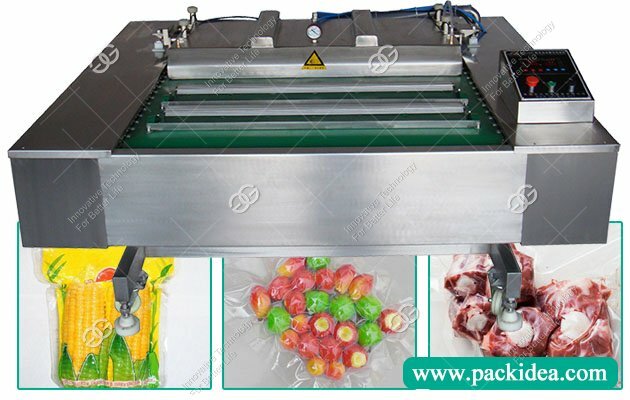 This vacuum packing machine is applicable to pickles, vegetables, frozen products, agricultural products, pickles, snack foods, conditioning foods, powders, spices, electronics, metal parts, pharmaceuticals, aquatic products, dried bean curd, chicken products, meat products, snack foods and other packaging. After vacuum encapsulation, it can effectively play the role of preservation, durability, moisture, mold, rust, pollution prevention, oxidation and vacuum sterilization, thereby extending the shelf life. For powdery, pasty and juice-packed items, the effect is hotter than ideal.